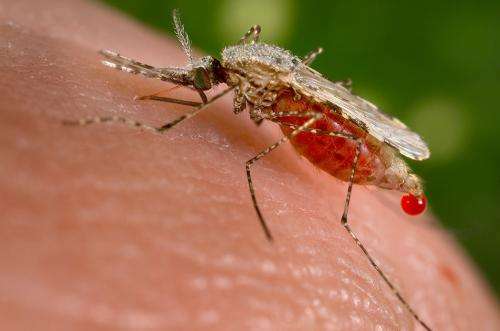 Researchers from LSTM, with partners from a number of international institutions, have shown the rapid selection of a novel P450 enzyme leading to insecticide resistance in a major malaria vector. In a paper published in PNAS the team of researchers led by LSTM's Professor Janet Hemingway describe how operational malaria control activities, and a move back to pyrethroid based indoor residual spray (IRS), has led to the selection of metabolic resistance in Anopheles gambiae on Bioko Island, Equatorial Guinea. Resistance involves a cytochrome P450 enzyme CYP9K1 which for the first time a role in pyrethroid resistance is established. Professor Hemingway said: "In theory it should be easier to eliminate malaria from an island than from a country on mainland Africa, and while we have seen the near total decline of two of the island's vectors, Anopheles funestus and Anopheles coluzzii this study shows how difficult that can be. The proof that this particular enzyme is also a marker for resistance to pyrethroids, gives us a further opportunity to monitor the rate of insecticide resistance and make evidence based decisions in line with national plans." Since 2004, IRS and long-lasting insecticide treated bed nets (LLINs) have reduced the malaria parasite prevalence in children on Bioko Island, which up until that point was one of the highest in Africa. After target site-based (kdr) pyrethroid resistance was detected in 2004 and rose in frequency the carbamate bendiocarb was introduced for IRS. When subsequent research showed that kdr alone was not operationally significant and activity of metabolic resistance genes appeared absent, pyrethroid IRS was reintroduced in 2012. This reintroduction, along with mass distribution of LLINs in 2007 and 2014/15, while dramatically reducing the An. funestus and An. coluzzii populations, in An. gambiae appears to have driven an increase in both kdr frequency, along with the selection of metabolic resistance via strongly increased expression of P450s, especially CYP9K1, which prompted a revision to bendiocarb IRS in 2016 to prevent a resurgence in cases of malaria. "Even with the decline of other mosquito vectors our study shows the difficulty posed by insecticide resistance in terms of malaria elimination." Continued Professor Hemingway. "The rapid evolution of resistance following the reintroduction of pyrethroid IRS, along with movement of infected people from the mainland highlights the importance of monitoring for changes in vector populations. This is especially important if we are to maintain the massive gains we have made in reducing malaria prevalence in Africa, 80% of which is attributable to vector control."